There is a growing interest in preserving the ancient past all around our great country by people of all ages. 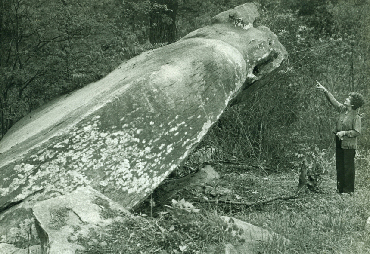 In the state of Georgia there has been a prevailing perception that ancient archaeological sites are unimportant and should be destroyed to make room for modern development. This perception is changing with a new generation of people who believe, as we believe, that preserving the past protects the future. For years we have secretly been hard at work unearthing one of the great lost ancient wonders of the world. You simply can not imagine how difficult it has been a. 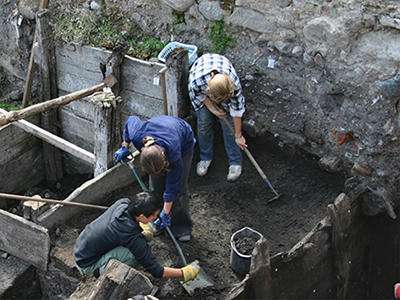 All our archaeological excavations have been by hand using shovels and muscle power, this is why it has taken years. Very few Americans know about Georgia's ancient Adena civilization that once ruled these lands over 4,000 years ago. 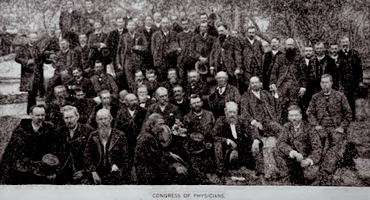 Although the ancient past has been buried in the sands of time we now live in a new age of discovery and people of all ages are becoming interested in discovering and preserving the past. Our goal is to build an Archaeological Park to raise awareness about ancient America's past civilizations, the mound builders, who thousands of years ago built America's great pyramid mounds. We need your help, so please join our Lithia Explorers Society its Free, Fun, Educational, and Amazing! 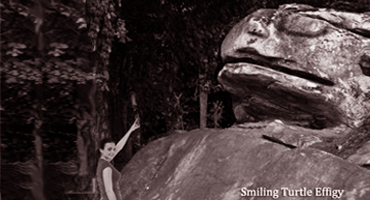 Be the first to have a guided tour of the Smiling Turtle Pyramid when it opens. 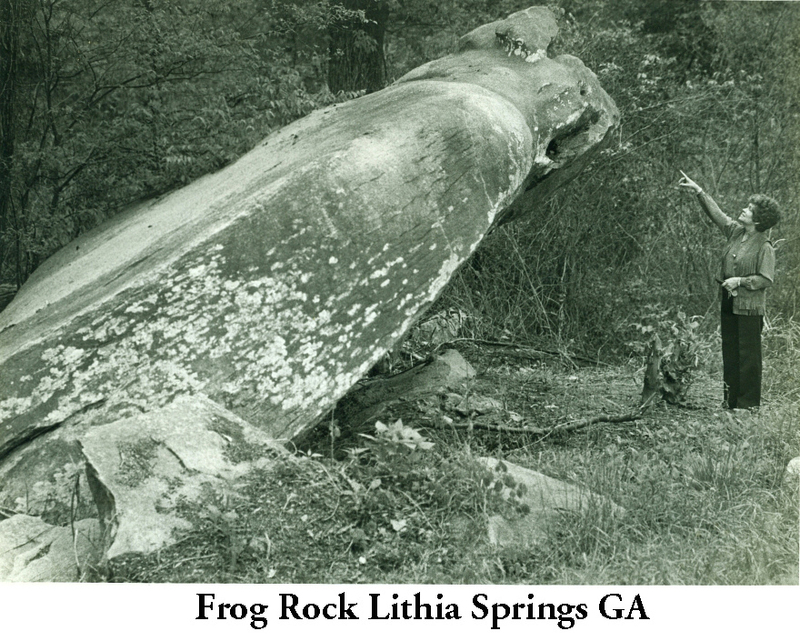 "Ancient Lithia Springs and all its archaeological wonders has been lost to time"
There are many types of turtles that live at Lithia Turtle Sanctuary. Yes, they are cute and they are shy. The native Indians long ago called the land we live in today Turtle Island. The term originates mainly from oral tradition, in the tale of the westward travel of the Anishinaabe tribe on this land they knew as Turtle Island. The Turtle is also the universal symbol of Long life and health. 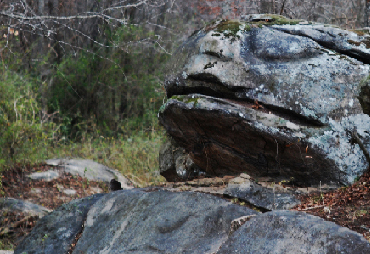 For thousands of years, a Smiling Turtle carved from solid granite has beaconed health seeker to come drink mother natures elixir of health, Lithia Mineral Spring Water. 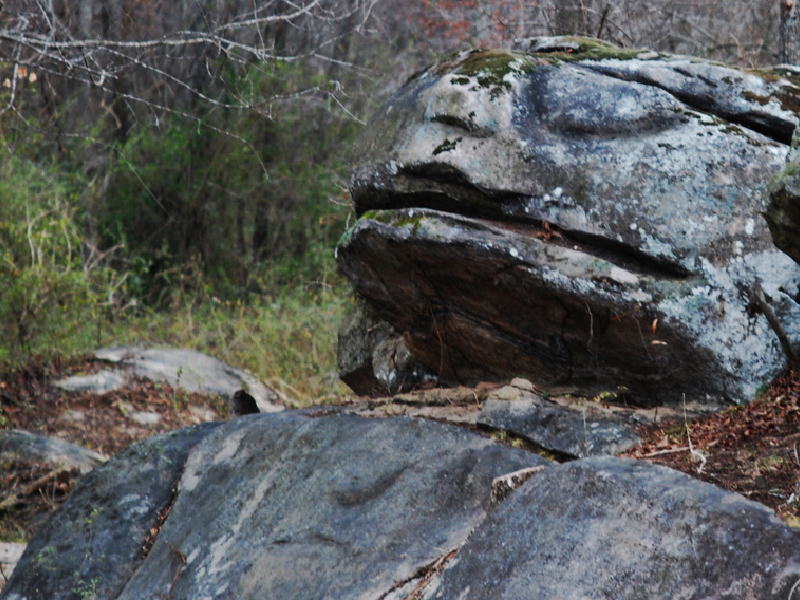 Once upon a time, the Giant Frog Rock was the most famous tourist attraction in Douglas County, GA. Everyone visited the Giant Frog Rock and took photos with it. Sadly, it now lays abandoned in the city of Austell's land, adjacent to Lithia Medicine Spring. 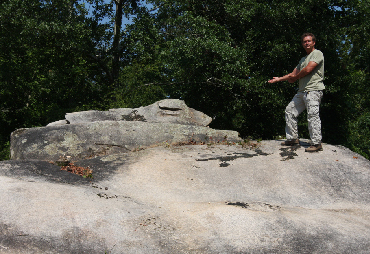 About 15 years ago the Department of Transportation (DOT) wanted to dynamite Frog Rock so that they could elevate and widen the road. Single handed, Gleda James (pictured above), fought the DOT and won to preserve this ancient wonder for future generations. 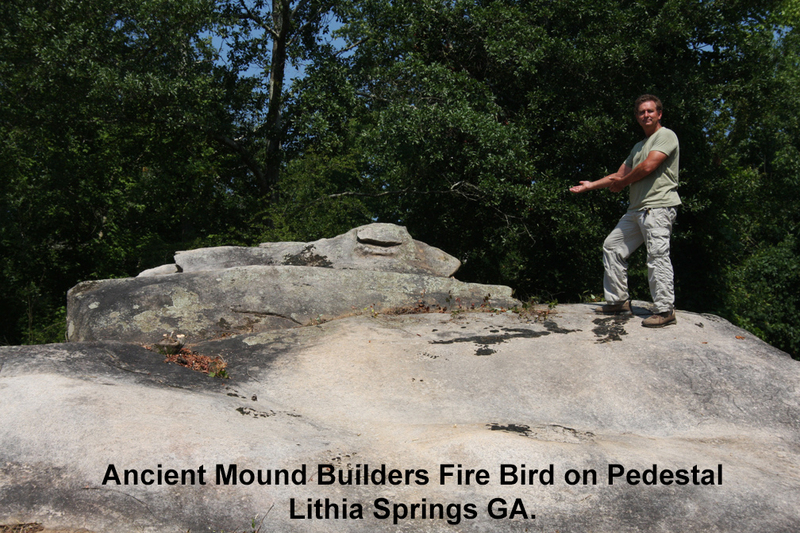 Standing on an ancient American step pyramid 25' above the ground Founder/Explorer Ian Simpson gestures to the ancient Fire bird effigy that he and his crew uncovered from the earth. About 10 years ago this ancient wonder was almost destroyed by the city who wanted to dynamite a path through Lithia Medicine Spring to build a sewer line. If it were not for local historian Gleda James the ancient fire bird would have been destroyed. Some say that the ancients carved this out of stone as a marker that points toward gold. 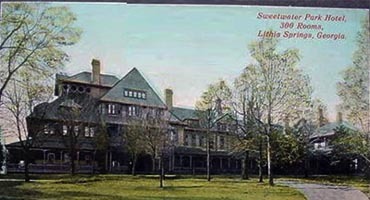 In 1887 Sweet Water Park Hotel, with 300 rooms catered to the rich and famous. 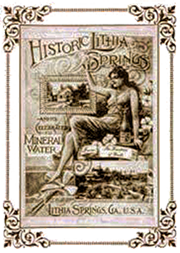 Presidents Grover Cleveland, William Howard Taft, William McKinley, Theodore Roosevelt, the Vanderbilt, and Mark Twain drank Lithia Spring Water that was purported to enhance health and longevity. A miniature train &quot;the little Anna&quot; took guest from the Sweet Water Hotel to Lithia Springs glass topped marble pavilion.